no pic this time... but i went down to the army/navy story in stockbridge and spent some time with Matt in the archery dept. (GREAT GUY) and he definitely helped straighten a few issues out with me. First off, we decided that since the longer draw was comfortable, and i could hold better form with it -- might as well stick with what works. I had it set on the shorter (26") and the first time I drew back, he asked if i thought it might be too short. I said that I had some opinions that it might be too long, but I just couldn't find a comfortable shoulder position (on my drawing arm) since I shortened it. SO we let it back out to 27" .. and adjusted the peep,... he did some other tuning on it, and talked a bit about why i thought it was so loud (apparently he doesn't like this model year because of the noise)... but i am not planning on hunting with this particular bow, so noise wasn't a big concern. put a couple silencer thingys on it ... and a pink d-loop and i shot GREAT groups when all was said and done. Even turned up the pounds, just a bit, to help build up those muscles. so, i'm all about getting the right form down, but its just way more comfortable at that longer draw. I got my elbow bent and turned out a bit more on my bow arm, and was finally able to relax my grip...just have to remember how i did it so i can do it every time! it was about a 40 minute drive... well worth it to have someone not just interested in selling something...but instead interested in answering my questions and helping out! You hit the nail on he head with being able to repeat it. Find your anchor point and do the same everytime. That is one of the issues with a draw length that is too long is it can be more difficult to find your anchor point consistently every time. What will happen is you will get your draw arm to the correct spot by placing your release hand in the same spot on your jaw, knuckle behind the jaw bone, etc... (whatever works for you), but your bow arm will be the weak link so to speak as you can either bend it too much, have it too straight, or have it just right. But you gotta do what works for you. Keep shootin and get it dialed in. Next bow you may check a 26.5" draw length if the 26 is too short and 27 is too long. glad ya got everything to your liking. consistency is going to be a learning thing for me, since I literally just started 3 weeks ago! For as much (actually little) that we've got in the bow so far, I'm VERY pleased with how its working out. This is definitely just a "starter bow" and once I get more comfortable shooting and with a higher draw weight, I'm going to upgrade and get that "perfect fit" in a long term bow. For now, I'm just working on learning the ropes, getting comfortable with the right form, and just having fun shooting at home and on the range. You are doing good so far....Just keep practicing and working on being consistent and having fun. Matt is a good guy Darcy! Been knowing him a long time!! Glad you found somebody to help you out in a professional manner. Matt is a good guy I bought my last bow form him. I wish he would have made you change your draw length to what fit you since you are so new you could have learned to shoot it with correct form with the correct draw length from the begining and not developed any bad habits. It would have gotten comfortable for you after a week. If you are going to use a draw length that is too long its going to be harder to find your correct anchor point every time. I learned that from experience. Good Luck and keep practicing. Last edited by quackwacker : 03-08-2008 at 09:12 PM. 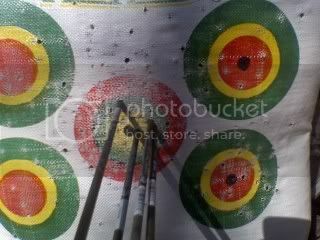 I heard that it took me a year to relearn to shoot after I got the right draw length. If I had it from the start man I would be hell on the range. Bad habits are hard to brake. Jus ask ole Hound doggie what happend the other night when I changed my draw length by 1/4 inch. It put my sight off by a foot! I had people ducking and back away when I was shooting. Correct draw length is so very important. I'm definitely not against changing it ... I just wish I had someone with more TIME to work with me on it. I know when I had it shortened for that little while, I was still setting it back on my face where I put it when the draw is longer. Matt was super busy friday... and I didn't wanna push him anymore, because he did spend like 2.5 horus with us setting up my and derrick's bows. Besides that, I don't know of anywhere around fayette/coweta that has a range, or anywhere to go to get some "free" advice on form/shooting. Thanks to the comissioners the county ranges were shut down years ago. Can't help you there, but if you can make it to any of the 3d shoots (hilsmans, CBG, 12pt) there are plenty of knowledgable people that will help you out. Come shoot, or watch, at Bear Country on Tues. night and you can practice all you want and get alot of help. Joel is very knowledgable. thanks for all the comments-- might try to make it to a shoot, but this week isn't looking good.